“How does it make you feel to be a representative of your school, Aseel?” I asked. She froze, hesitant to answer. It was at that moment she took a deep breath and let out the most genuine response I could have hoped for. Aseel participates in a letter writing activity within our refugee sponsorship program in Egypt. As the war in Syria enters its eighth year, there are still children who are out of school, and most are up to six years behind in their reading and math skills. This, I cannot believe! For refugee children, war has put their educations – and therefore their futures – at risk. Back in October, I was able to visit Save the Children’s refugee sponsorship program in Egypt. I witnessed firsthand the impact being made in the lives of children who, at one point, were without an education. During my visit, I was given the opportunity to meet our four child ambassadors – Aseel, Mohanad, Malak and Karim. Each of these inspiring children expressed their gratitude for having Save the Children in their community school and felt honored to be chosen as a representative among their peers. 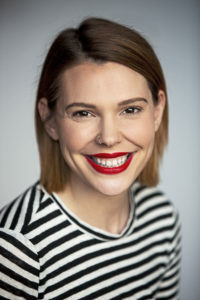 I watched plays orchestrated by local Save the Children staff to promote hygiene in a fun and inclusive atmosphere (think big toothbrushes constructed out of cardboard and plastic straws!). I heard the excitement in the children’s voices when they talked about attending summer camp and art exhibits. It made me smile knowing that our sponsors are giving vulnerable children the education and support they need to succeed. 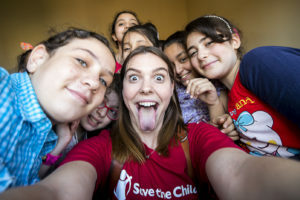 Global Sponsorship Multimedia Storyteller Victoria, takes a selfie with children in our refugee sponsorship program in Egypt. After meeting each of these children and hearing their stories, I couldn’t help but notice their sense of self-awareness. 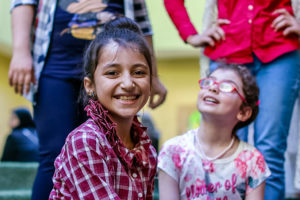 All of the incredible support we receive from sponsors like you allows refugee children to thrive in a safe environment, one where they can focus on learning and just being kids again. These children recognize what is happening in the world, even though they may not understand it. They realize that they have been given a second chance, and they know they have to work hard. Because of your generosity, refugee children are able to continue their educations and dare to dream of their futures. It moved me to see these young children serving as leaders within the community and talking about their hopes for the future. This is what your generosity is doing. You’re helping provide the care and support these children desperately need to pursue their dreams. Thank you for making a positive difference in the lives and futures of refugee children like Aseel. Life has not been easy for 13-year-old Giveness, a grade 6 student in Lufwanyama, Zambia. She lives in a small village called Chifumpa with her mother, father and younger sister, 9-year-old Bibiana. Villagers here earn their living by fishing and farming. Giveness makes sure she helps her mother with washing dishes and fetching firewood, which are common daily chores for children in this rural part of the world. 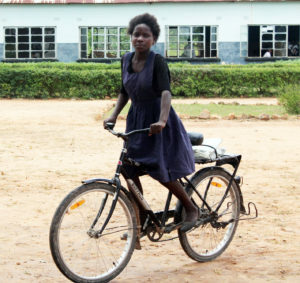 Giveness with her bicycle, which cuts her 3-hour ride to school to just 1 hour! Determined to be a nurse when she grows older, she goes to school every day with her sister. In the past, they would walk side-by-side for three hours each way to school through the thick forests that surround their village, spending an unbearable six hours walking each day. Because of this, children like Giveness and her sister were frequently absent and had to repeat grades due to poor school performance. For some, rivers and lakes further impede travel, when during the rainy season floods make some areas completely impassable for the unsupervised children on their daily journey. “Before Save the Children gave us bicycles I used to walk 15 kilometers to school and back every day. I would start off at 5am when it’s still dark with my young sister. We would walk for 3 hours and our legs would be sore. We almost gave up on school. But now that I have a bicycle my legs feel better.” she shyly says in the local language, called Lamba. Giveness is now able to go to school every day and carry her sister along with her on her bicycle, like many of her friends that have also received a bicycle thanks to sponsorship funding support, purchased through a community cash transfer program. 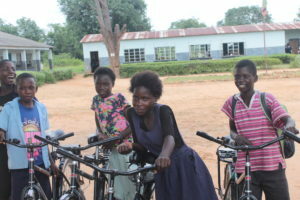 The head teacher also shared that the number of children attending school has risen as those that have received bicycles carry their friends and siblings along as they go to school. Giveness smiling with her friends outside of their sponsorship supported school. 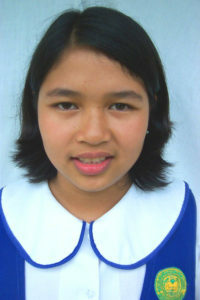 “I am so happy to be sponsored because I am able to learn, receive letters from my sponsor, and also have a bicycle. When I grow up I want to be a nurse because I am acquiring a lot of knowledge at school.” Giveness says proudly. Giveness now cycles to school within an hour and another hour to get back home. Instead of taking a journey of six hours, it now takes her just two, and she does not miss out on any lessons because she is always on time and no longer constantly tired and sore. Thank you, sponsors, for making this possible! “My sponsor’s name is Kim,” 6-year-old Maria proudly told me as I spoke to her one day after class. I was visiting her community in South Central Mindanao to deliver the newest letter she had received from her sponsor. 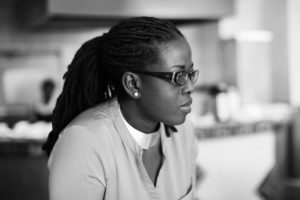 She spoke confidently and proudly, and sounded like she knew her sponsor very well. Maria and her family live in an area where most families do not have the ability to provide three meals a day, have clean drinking water or even a single toy for their children to play with. Her father works as a driver, who is able to come home only on the weekends, while her mother stays at home to take care of Maria and her 9-year-old brother, Zyrich. Maria smiling in front of her classroom. Having a sponsor keeps Maria excited about her days. She is eager to share with Kim about her life and about what she is learning in school. People from Maria’s hometown have little mobility to move beyond the community – it is a small and remote village where usually people only travel as far as where they can reach on foot. Her eyes light up with wonder when she reads the letter describing what it is like in the country where her sponsor lives, in the state of Texas in the United States. Hearing stories about the different places in her sponsor’s life has made her realize that the world is bigger than she ever imagined it to be. She knows there is so much beyond her community now and she awaits for stories about that world in the letters she receives – learning about Kim’s family, her pets and the places she has visited. Maria clearly remembers that she received three letters from her sponsor, each equally exciting and wonderful, over the little over a year she’s been sponsored by Kim. “It makes me happy to know that I have a picture in their house,” she shared smiling, describing the photo all sponsors receive from their sponsored children each year. Maria’s facial expression was more than happy as she continued to tell me that she felt like she’s part of Kim’s family, and that she feels cared for even though they are countries and oceans apart. After two years of attending our learning programs, Maria is now happily attending her first grade in primary school. These sponsorship supported programs have provided Maria and the other children in her community with reading camps to practice their reading skills with peers, the provision of new learning materials and book banks from which books can now be borrowed, and additional supplies for their schools that enhance literacy and numeracy skills. Maria now knows how to wash her hands properly, thanks to sponsorship health programs in her school. Today, Maria says she wants to be a teacher so she can teach more children how to read, write and color pictures as she is so fond of doing! She tells me she cannot wait to share this dream with Kim. 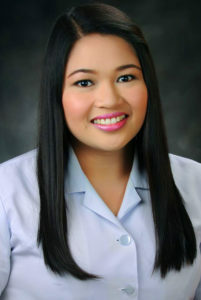 If I were able to meet Maria’s sponsor, I would tell her that she has all the reasons to be proud of Maria. 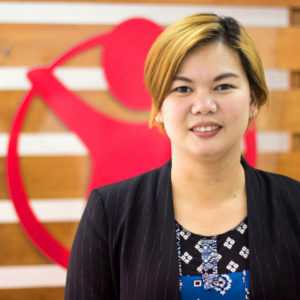 Aside from her astounding progress in school, she is also one of the Child Ambassadors who represents her community in Save the Children’s programs – serving as an embodiment of the achievements her community has been able to implement with sponsorship support. Sponsorship shares and inspires not just future teachers like Maria, but future doctors, police officers, pilots, veterinarians and more in the over 20 countries where we implement our programs. If you haven’t written to your sponsored child yet, we encourage you to do so! Our experience tells us that letter writing is extremely rewarding for sponsors and children alike – you may help to shape their future dreams! 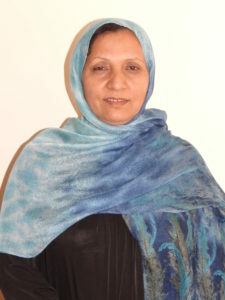 My name is Anisa Naimi, I have been working as a School Health and Nutrition Officer with Sponsorship and Save the Children in Afghanistan for the past nine years. 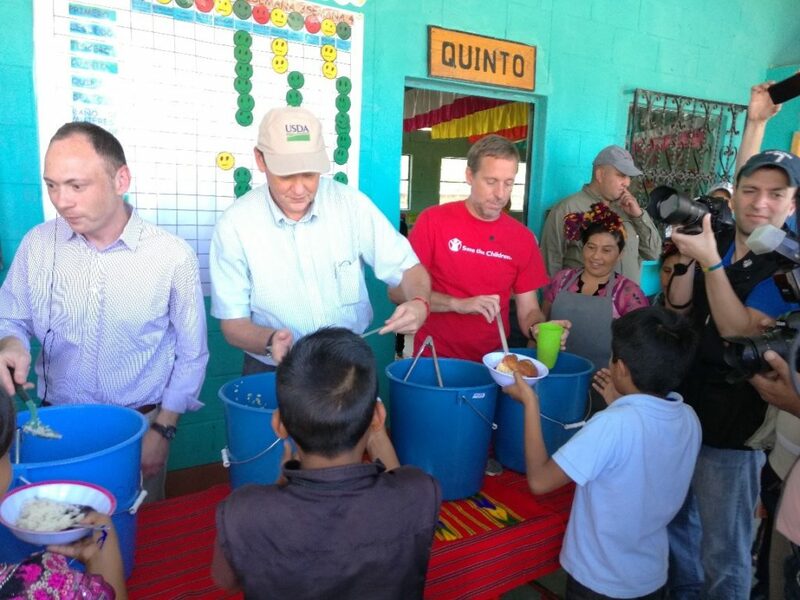 Sponsorship’s health and nutrition programs are designed to improve the health of children and to reduce malnutrition, which in turn enhances children’s scholastic performance. Healthy living habits are promoted by involving children in health campaigns held in their community or at their school. 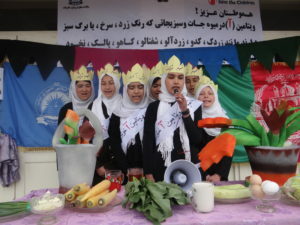 We arrange for at least two campaigns to be held in each village in which we work each year, on topics like the importance of healthy nutrition. Campaigns are coupled with the distribution of vitamin A supplements and de-worming tablets so children not only leave with improved knowledge of how to stay healthy but leave a little healthier that same day! Vitamin A campaigns and distribution is one of my favorite parts of my job. After we meet with community members and other local stakeholders who help us organize campaign days, we travel to the far away villages that we bring our Sponsorship programs to. Children sharing health messages through songs. One such day we had to go very far, passing through rough roads, multiple valleys and by small villages. Once we were close to the school we started to see students and their parents walking from the nearby villages towards the school, where the day’s event would take place. All around us children were confidently calling out to the villagers through loudspeakers to encourage them to participate in the activities. 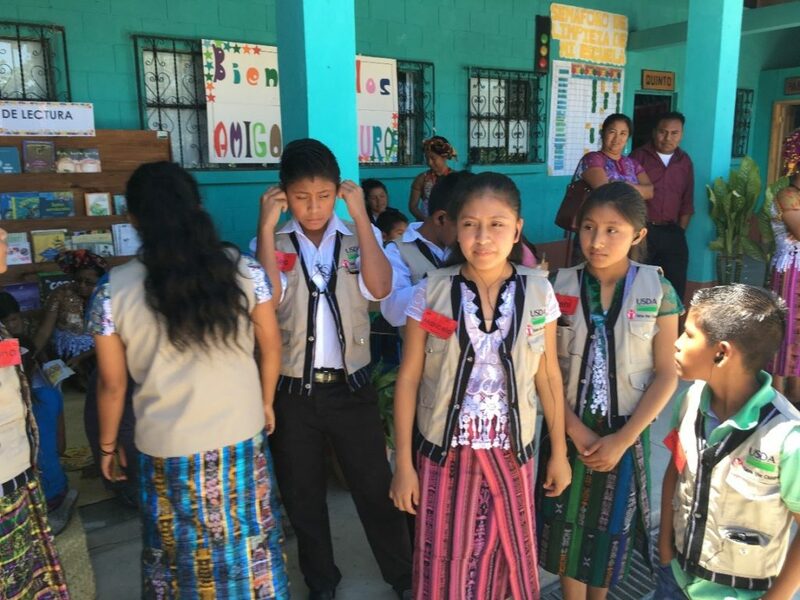 The first thing we do when we enter a school is prepare child-centered health education groups, so that children can have fun while learning with their peers. We lead the groups in learning about health topics through role playing, singing songs and playing games. 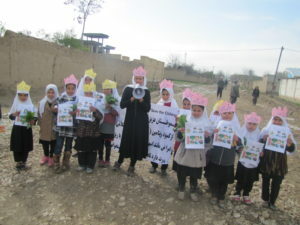 Children also learn how to spread messages about how locally available fruits and vegetables provide good sources of vitamins, by holding banners they’ve made and sharing presentations. A group of children spreads healthy habits through their community. As a School Health and Nutrition Officer, I led the children in these exercises. I am happy to be spreading health messages to communities and schools to raise people’s awareness about healthy habits and behaviors, and improving people’s lives. During this year’s events the children were all very active participants. We have been inspired by the children to continue working hard to implement the program. They dream of a better future, and we can help them make that happen.